Sep 20 [ C O L A B B O ] M.E. x Reebok "Constellation"
Reebok Classic continues its exclusive partnership and design collaboration with Los Angeles based designer Melody Ehsani with the introduction of the "Constellation Pack" for FW14. The collection features the Freestyle and the Classic Leather, which are reworked with Melody’s signature daring and directional designs. Melody's inspiration: the navigational use of the night sky and the idea of finding your own path; despite having your feet on the ground, looking up into the endless, unknown universe will guide your every step. 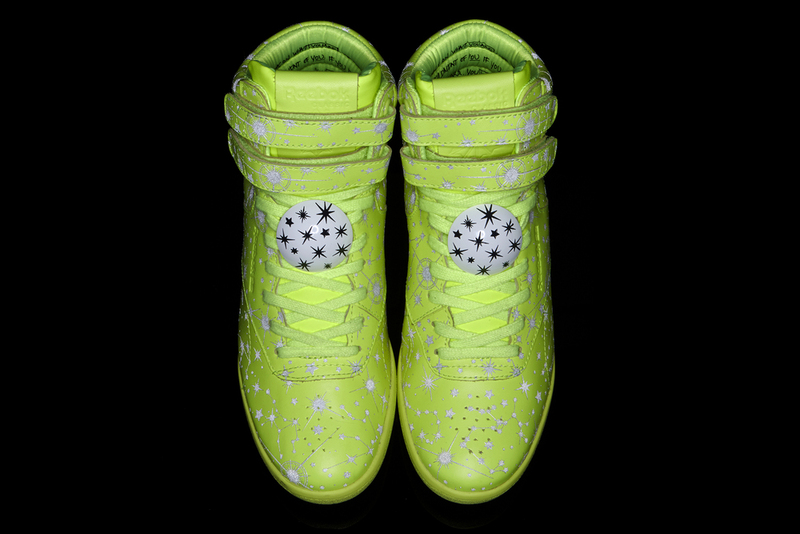 Constellations printed in reflective 3M graphic for a standout detail that dazzles at night. Handwritten message hidden on the inside collar. Reebok’s iconic Classic Leather and Freestyle silhouettes are re-interpreted by Melody and updated with a platform midsole and hidden wedge respectively, for two fresh and contemporary designs that are unapologetic, special and multi-dimensional, just like the women who will wear them. Strictly limited edition, the Constellation Pack will be sold for $149.99 and will launch exclusively at the Melody Ehsani flagship store (424 1/2 N. Fairfax, Los Angeles, CA 90036) from September 19th, and then retail through global fashion retailers from September 26th. Jun 12 Reebok CrossFit Shoes. What's The Hype? Feb 28 March '14 Shoe Lover :: Heather Shotke for "GramMARCH"